Jatiluwih Bali Rice Terraces tourist attraction, with stunning charms of its famous ricefield terracing has made Jatiluwih tourist destination recognized as one of the world heritage site (UNESCO), that wide stretched on the slopes of Batukaru mountain situated at northwest part of Bali Island of Gods. Jatiluwih rice terraces tourist area indeed very remarkable, which capable to attract and anesthetize millions of travelers to visit this tourist places. So for a comparison let's consider, if you fill your holiday time by traveling into a crowded places with full of cities hustle and bustle, maybe you already get used to these situations. But have you ever imagine how the next story will be, if you stepped on your foot to exploring the real atmosphere of Bali off the beaten track, that recognized by UNESCO as one of the world heritage site, ie: "SUBAK JATILUWIH". As we all knows, if we are talking about the existence of Jatiluwih village is actually so attractive to be explained, in addition this area is also one of the best place that becomes centre of rice granary which existed in Bali paradise island. 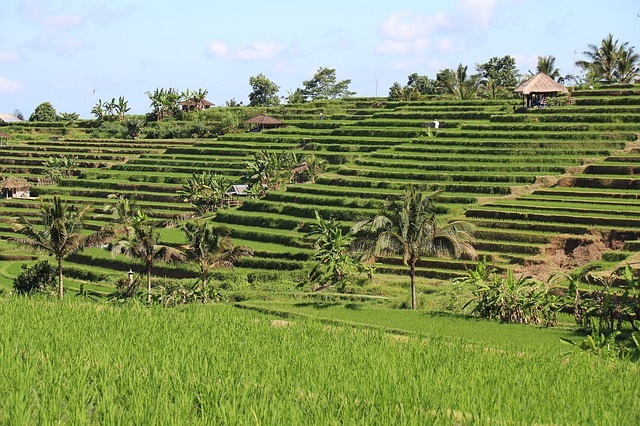 Jatiluwih village so famous with its beautiful ricefields terraces, and this area is supported with backdrop stretch of green hills, also the traditional system of water irrigation (Subak) which already well-known will become an interesting activity to be known during your vacation in Bali. For you who really eager to enjoy the authentic panorama from atmosphere of a truly Bali rural nature, honestly Subak Jatiluwih will be the right place as a targeted for recreation options. 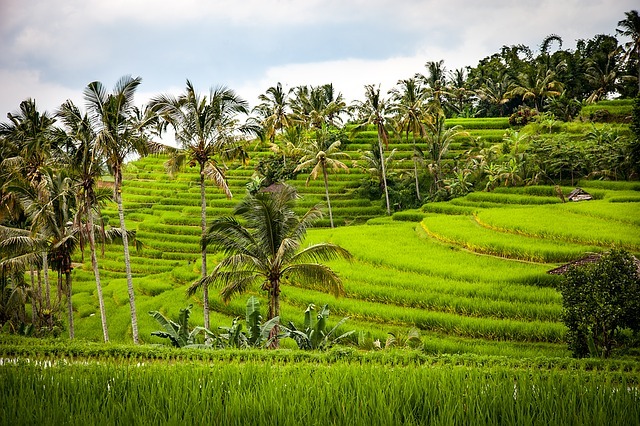 No wonder up to this moment, "Jatiluwih Bali rice terraces tourist object" capable to attract a large number of travelers both from inside or outside the country when they are enjoying Bali holiday tour packages. The characteristic mainstay of Jatiluwih tourist attraction, ie with the existence stunning beauty of real Bali countryside which decorated with the greenery natural view of the amazing rice terraces, also the daily activities from simple life of local balinese society which is away from the urban bustles. In here, you will be able to know and understand more closely about something unique from the island with thousands of temples, especially the Subak traditional water irrigation system owned, natural beauty, tranquility and rural life of balinese hindu community (local people) who still cultivating (plowing) the rice fields by using traditional methods. Jatiluwih is derived from word "JATON" and "LUWIH", Jaton means: amulet, while Luwih means Best. So literally word "JATILUWIH" means: a village which has a really best talisman or intestate". Another source tells that, previously in the middle of village there is a graveyards of an ancient bird animal, namely "JATAYU", then from the word Jatayu gradually changing the sound become "JATON AYU" which means: "Luwih" or Best. So JATON AYU equal to Jatiluwih. That is finally word of Jatiluwih since the first setoff to be a village's name, and until now has not been changed. Read also: "[Jatiluwih tour program] Itinerary full-day tours visit Bali rice-terraces"
So the existence of Jatiluwih village as the best talisman villages, can be proved with enough agricultural produced to meet the needs of life for all societies and ensuring safety for developing farm life in this place. Presently, inhabitants of Jatiluwih villagers totaled: 2,680 people, or about 812 family's heads and geographical conditions of Jatiluwih village is an agricultural area with the livelihoods majority as rice farmers. While from demography condition (population), still dominated as farmers and workers supported with a very spacious and nice ricefields, so it could attract a large number of tourists from abroad to visit Jatiluwih village. From religious factor, majority the community of Jatiluwih village are hinduism, while from cultural side Jatiluwih village has a tradition, especially in cremation ceremony not be burned, but buried it. In terms of art, several places at Jatiluwih village has own the group of arts, such as: "Joged Bumbung Dharma Susila" that existed at Kesambahan Kaja village, which have been performed at several of tourist events. The group of arts which founded in 2009, has 35 members of "Sekaa" (arts group), and the first emergence of this art as a means of religious activities, in addition also used as an entertainment and tourist attractions. The potential tourism of Jatiluwih villages supported by unspoiled natural scenery, cool atmosphere, clean mountain's water which suitable for eco-tourism development, also away from air pollution and noisy of vehicle's sound. 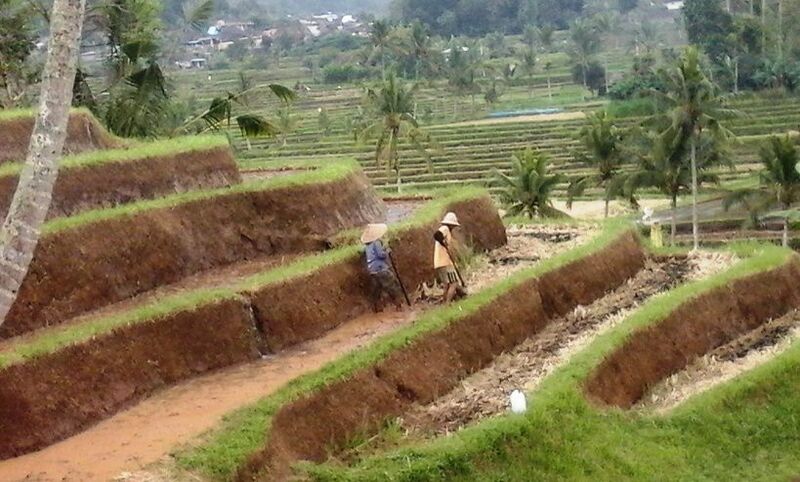 In addition, the traditional subak irrigation systems of Jatiluwih village that already well known, which is led by a "Pekaseh" and for Subak water irrigation led by "Kelian Subak" (person who heads the field distribution of water irrigation for rice cultivation). At Jatiluwih village, there were 7 (Seven subak). Beside that, the land agricultural processing are still with traditional methode, by using cow or buffalo to plow the rice fields. Regarding harvesting time also still using traditional way, ie: using "Ani - Ani" as a primary means. In a normal land preparation, planting and harvesting still use a pattern of mutual cooperation. 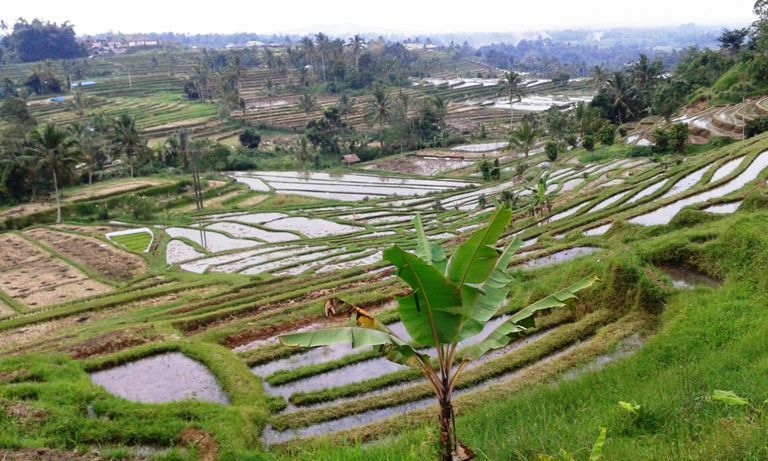 From Jatiluwih village, we will be able to see a very spacious rice fields with its green mountains and dense forests. As a means to support Jatiluwih village, right now there are several restaurants, cafes which provides of special Jatiluwih's food with basic ingredients brown rice. Read also: "[Jatiluwih tour price] Best rates full-day tours package Bali ricefield-terraces"
While the visit time at Jatiluwih village open from at 8:00 am until 6:00 pm, with the cost of entrance fee ticket will be charged at IDR. 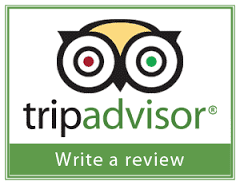 40.000 and the rates quoted per person. 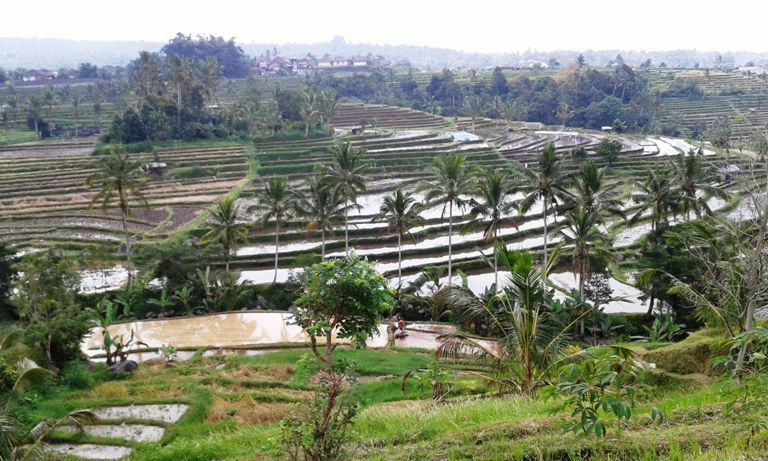 Once again, the existence of Jatiluwih village is very famous, which has been recognized by UNESCO (Organization of the world union bodies engaged in education, science, and culture) as one of world heritage site with its beauty of ricefields-terraces, and the amazing view that located at an altitude about 700 meters above the sea level. Finally....that's all the explanation about (UNESCO) World Heritage Site Jatiluwih Ricefield-Terraces tourist area from us.